Still it is quite a big step forward because we have been blocked at that point for a while and it has been unblocked in just an afternoon. In the past months, Xavi and me spent many hours looking for a proper API in IPython to do what we wanted without getting too low level (and postal). Now that IPython provided that new API (and documented examples), it has been quite straight forward to integrate. many hooks to add our bells and whistles. So it seems a text console, but it is not. Yep, we can add many bells and whistles there. Lately, we clearly realized that ipyclam strength is clearly empowering CLAM prototyping, by adding interactive Python scripting and PyQt/PySide to the QtDesigner/NetworkEditor graphical design tandem. But the original motivation for ipyclam, which was very shortsighted, I must admit, was providing NetworkEditor with a complementary console to deal with big and complex networks where graphical patching was not practical. And that’s a milestone that we have not reached yet. I’ll try to abstract the problem so that it could be useful beyond CLAM. We had a domain object implemented in C++ and we wanted to provide a Python console (a Qt widget) to manipulate it. So the first goal, which Xavi achieved very succesfully, is to build a Python wrapper, ipyclam to the domain object, a CLAM::Network. 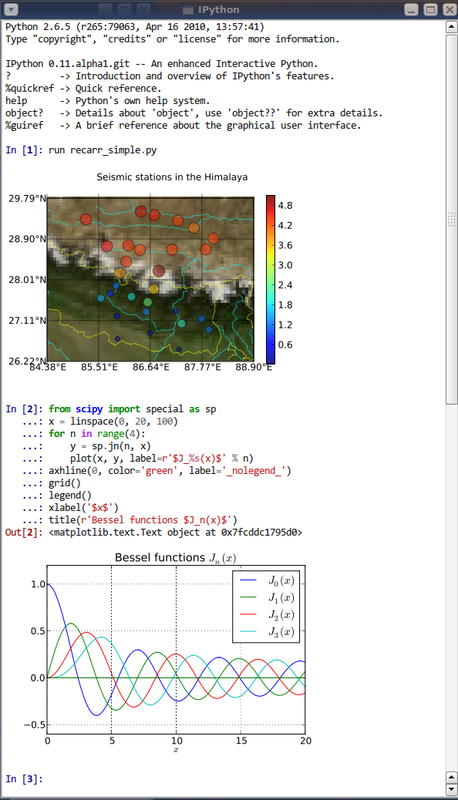 IPython separated quite well the concepts of Python kernel from the Qt Console. Indeed it separated those concepts that much that they were at different processes and that made our goal unfeasible, at least, by using the stable high level API of IPython. Luckily, IPython 1.3 provides high level interfaces and examples for having both kernel and console in the same process connected via a local pipe. 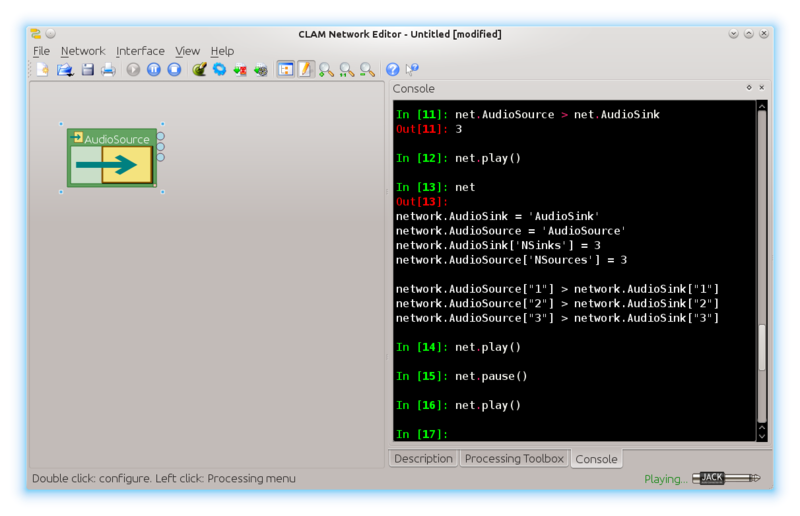 I took that code and changed it to be able to inject the CLAM::Network and I got a Python script that serves as Qt based ipyclam_console which I named ipyclam_qtconsole.py and it is working at the repository. I modified the code from Jarosz Pawel to get the kernel encapsulated inside the console widget itself and I added a function to easily injecting objects into the interpret main namespace, for example the ipyclam network object. Still the example was a Python program using a PySide base widget. Gladly, we already had taken our quest to get the PySide and PyQt4 working all together with C++, and we already have a few functions to transfer up and down QObjects from and to C++. So if I can abstract the whole thing into a QWidget I could use it as is and I still can’t believe it worked that well. NetworkEditor depends on Boost-Python and Shiboken on compile-time, has to be both? Polishing ipyclam for some nasty things you get when you play a little with it.